The MANA men go to work on adorning the balsa board in Sorrento. Cynthia Penna and Andi Campognone with the MANA crew at the Art Hotel Gran Paradiso. Alex Couwenberg and Andi Campognone enjoying themselves at the Art Hotel Gran Paradiso. David Lloyd, Ned Evans, Andi Campognone, Alex Couwenberg, Ben Brough, Arianna Padron and Smyth Johnson enjoying the Sorrento scenery. Renato Penna and Dario Correale in the hotel lobby with the finished MANA art piece! Cynthia Penna + artist Eric Johnson yukking it up, mustachioed. The predominant reason Deb and I made the transatlantic journey to Italy was for the Villa di Donato exhibition "The Artists of the Film MANA," as organized and curated by Naples' Art 1307 association, spearheaded by Renato + Cynthia Penna and Los Angeles' very own powerhouse Andi Campognone. The artists in this exhibition were culled from the MANA project's original ten "Light and Space" artists, a project launched in 2013 by Andi, currently the director of the Museum of Art & History in Lancaster, California. MANA the documentary (produced by Andi C. and shot and directed by L.A.'s art scene photographer and chronicler Eric Minh Swenson), was filmed in Hawaii in the summer of 2013 and screened last year in Naples. Out of the ten original MANA artists, Ned Evans, David Lloyd, Ken Pagliaro, Steve Fuchs, Ben Brough, Alex Couwenberg, and Eric Johnson made the trek to Italy to attend the opening reception at Villa di Donato and partake in an incredible collaborative art project at the Art Hotel Gran Paradiso with Rosario Guida and Dario Correale, Napoli surfers who also make art (a difficult combination to discover, says Cynthia Penna!). Yes, it may be true that all the artists in this particular show are men. But it's the women who are in charge here. In charge like a boss, baby. Like. A. Boss. With sheer cliffs overlooking the sea, the Art Hotel Gran Paradiso in Sorrento has its fair share of naturally-occurring artistry, but Cynthia Penna has helped to make this resplendent four-star hotel an outpost for original works of art, devoting specific guests' rooms to the work of individual artists from all over the world (such as the talented and lovely Carla Viparelli). 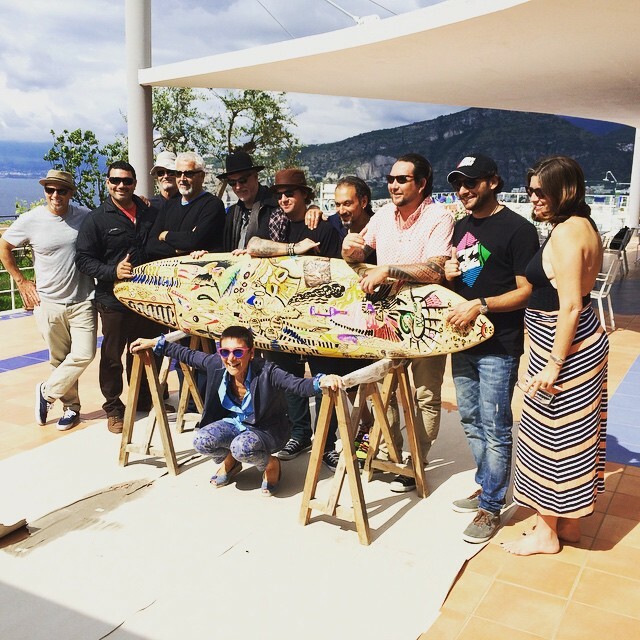 On May 26th, the aforementioned motley crew of ocean-loving MANA artists and their Italian counterparts got together in the blazing Sorrento sunshine and adorned a custom balsa board shaped by Dario expressly for this monumental event. They worked off of one another's drawings and sketches and doodles and patterns for nearly two hours, eventually placing this finished beauty in the hotel lobby, where we hear delighted guests have been taking photos alongside it since. Following the collaborative event uniting the talents of Los Angeles and Naples, there was food. Lots and lots of food. And wine. And cappuccinos. And Limoncello. And cake. And some of us even dove into the "bracing and refreshing" swimming pool.